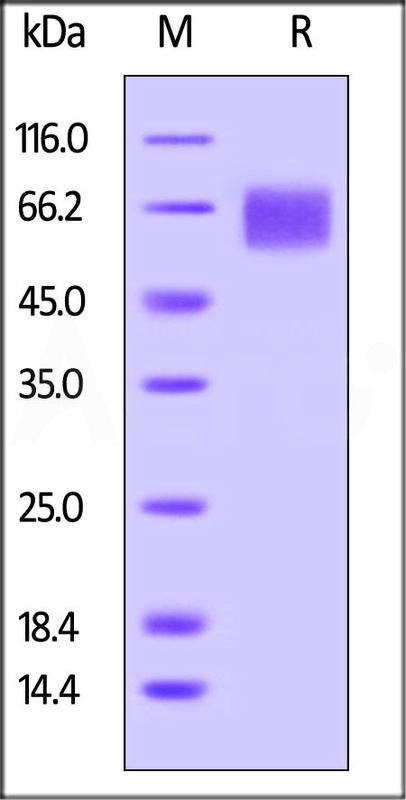 Biotinylated Human IL-6 R alpha, His Tag (CD6-H82E8) is expressed from human 293 cells (HEK293). It contains AA Leu 20 - Pro 365 (Accession # P08887-1). The protein has a calculated MW of 41.7 kDa. The protein migrates as 55-70 kDa under reducing (R) condition (SDS-PAGE) due to glycosylation. 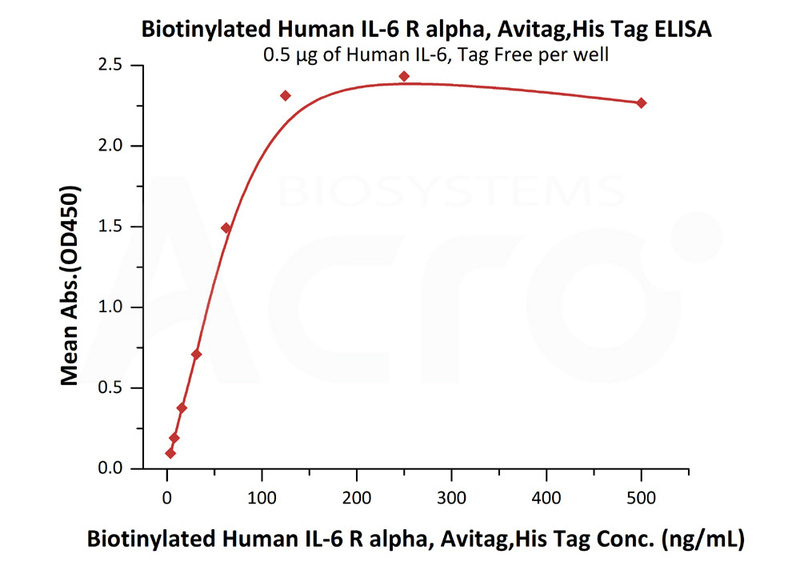 Biotinylated Human IL-6 R alpha, His Tag on SDS-PAGE under reducing (R) condition. The gel was stained overnight with Coomassie Blue. The purity of the protein is greater than 95%. Interleukin 6 receptor (IL6R) is also known as CD126 (Cluster of Differentiation 126) , is a potent pleiotropic cytokine that regulates cell growth and differentiation of various tissues, and is known particularly for its role in the immune response and acute phase reactions. IL6R is a protein complex consisting of a IL-6 receptor subunit (IL6R) and interleukin 6 signal transducer Glycoprotein 130. IL6R also denotes the human gene encoding this subunit. Alternatively spliced transcript variants encoding distinct isoforms have been reported. IL6R subunit also shared by many other cytokines. The soluble form of IL6R arises from proteolytic cleavage of membrane-bound IL6Rα, and acts agonistically by making the IL6 ligand accessible to the signal transducer gp130. Dysregulated production of IL6 and IL6R are implicated in the pathogenesis of several inflammatory diseases and malignancies such as multiple myeloma, rheumatoid arthritis, or osteoporosis, and it has been reported that a humanized anti-IL6R monoclonal antibody is a promising agent applicable to the therapeutic approach for IL6 driven diseases. Interleukin-6 receptor has been shown to interact with Interleukin 6 and Ciliary neurotrophic factor. (1) Taga, T., et al., 1989, Cell (UNITED STATES) 58 (3): 573–81. (2) Schooltink, H., 1992, FEBS Lett. (NETHERLANDS) 314 (3): 280–4. (3) Yoshio-Hoshino, N. et al., 2007, Cancer. Res. 67: 871-875. (4) Egler, R.A. et al., 2008, Clin. Cancer. Res. 14: 7028-7034.